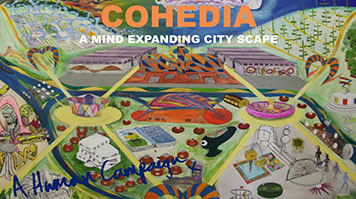 A 21 piece exhibition, entitled My Human Campaign: Cohedia’s Summer Fair, will launch on 16 June to coincide with London’s Creativity and Wellbeing Week. London South Bank University's (LSBU)’s School of Health and Social Care welcomes this residency as the works aim to help students to creatively learn about caring for people who are experiencing health or social issues, with compassion and resilience. Xavier White’s personal experience of sustaining a near fatal head injury during a bike ride through South London means he is a member of the HSC People’s Academy, as a health and social care expert by experience. Xavier informs and inspires others to consider their own personal journeys in search of “Cohedia”, a speculative utopian world where collective expression forms the basis of knowing, being and doing. Through this work Xavier expresses a long standing interest in neurology and learning processes in health care, with a focus on hidden connections within the brain, creative interactions taking place internally and how these hidden communications can be further understood through intentional human connectivity. My Human Campaign aims to be a ground-setting exhibition that explores how art can promote understanding of the ‘hard problem of consciousness ’: investigating the leap between our neurones (Brain) and our consciousness (Mind). As part of the exhibition Xavier will also be giving a series of interactive sessions, talks, workshops and tours. “My Human Campaign, Summer Fair Exhibition outlines and sets the pace for my research into resilience, compassion and wellbeing. “As a brain injury survivor, I finally discovered my path in life as a creative person, using my personal strengths and weaknesses to move from a lonely outsider to be involved, fitting in, cooperating as part of something bigger than myself. “My Human Campaign residency at LSBU is an opportunity to develop visualisation of our conscious minds and the effects they have on our behaviour and interactions with the environment and wider world around us. “An artist in residence at the School of Health and Social Care has already enabled curious conversations about how art influences health and wellbeing. “It is often said that art speaks volumes, more than mere words in conveying the complexity of therapeutic and healing encounters.